THE GROWTH OF FLY-FISHING is not so obvious as that of many other pastimes. The goal-posts of football, the nets of lawn-tennis, the pavilions of cricket bear silent witness to the prevalence of those games; nor, if the verbal jingle may be pardoned, does it need the “sight of the lynx” to discover the omnipresence of golf; while the detailed reports of matches, which have spread from the strictly sporting newspapers to the columns of the press at large, testify to the growing interest taken in these pastimes. All of these games, however, are essentially contests in which, individually or collectively, man is pitted against man. Even the kindred sport of bank-fishing is more in evidence than fly-fishing to the observant traveller. In the Thames Valley, by the Lea River, on the towing path of canals, on the margin of pond and pool, wherever, in short, free fishing is to be found, the waterside seems dotted with fishermen, each sitting like Patience on a wicker basket watching his float. Fly-fishing, as becomes the poetry of angling, bids her disciples cast their lines in solitude. In solitude—grand, solemn, and but for the “noise of many waters,” silent, is the capture of the bold sea rover, salmo salar, in his mountain girt native fastness attempted. In solitude—peaceful, smiling, yet silent, too, but for the sighing of the sedge, the “murmur of innumerable bees,” and the friendly twitter of the swallow, is the death of his timid inland cousin, salmo fario, compassed by means of gaudy silk and fraudful feather. Although the fly-fisher is thus hidden from the common eye, as in a “wilderness of sweets,” it is, however, possible in some sort to gauge his growth. To this end, without laborious investigation of statistics, let us glance at the manufacturer and sale of his implements, and at the literature concerned with his art. TAKING HAPHAZARD A NUMBER of Fishing Gazette published in January  last, I find therein advertisements of about 140 makers of fishing-tackle carrying on business in England, besides those of several well-known Scotch, Irish, and Welsh houses. How many other makers can be found advertising in the columns of the Field, Land and Water, the Illustrated Sporting and Dramatic News, Rod and Gun, or in the local papers such as Yorkshire Post and the Northern Angler, I have not been at the pains to ascertain. I have selected the Fishing Gazette as the only London journal known to me which is exclusively devoted to angling and fish-culture. At Redditch, the centre of the wholesale fishing-tackle trade, literally tons of rods are turned out every year; but many of these are for export. I have, moreover, been unable to learn the proportion of fly-rods to trolling and other rods, and the ratio of increase in output during the late years. I am told, however, by a maker I can trust, that the yearly increase is enormous. But from Alnwick, better known to many an angler for its glued-up split-cane rods than for the old feudal fortress of the Percys, I have more specific information. Ten years ago the annual output of fly-rods from the Alnwick Works was, I am told, about 800. Of these 250 only were cane-built. At present it is as follows: Cane-built (with and without steel centres), about 3,500; greenheart, whole cane, and other materials, 1,600. These figures are the more convincing when one calls to mind the fact that cane-built rods, in which the increase is most marked, are of necessity very expensive; each joint being made of six strips split from the hard elastic rind of the Indian male bamboo, so adjusted that, when glued and bound together, they form one solid structure. 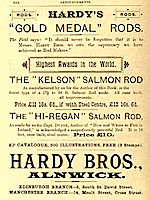 They are made, and well made, elsewhere in Great Britain (to say nothing of America), but Hardy Bros. of Alnwick have always had a well-merited reputation for their manufacture. Some people think them not quite so durable as solid-wood rods, but with care they will last for many years; and, although I fear I can hardly claim for anglers that they are wholly free from the weakness of buying for novelty’s sake what they do not strictly need, the number of rods sold in one year probably bears a very small proportion to the number of anglers using such rods. I THINK IT MAY be taken as proven and out of hand that the fly-fisher, though invisible, exists in thousands, and multiplies. I shall, therefore, in briefly touching on the literature provided for his special benefit, seek rather to learn what manner of man he is, than what may be the numerical strength of his company. As bearing on the latter question, it is, however, instructive to note that the earliest printed list of angling books—which appeared in Sir Egerton Brydge’s Bibliographica in 1811—consisted of only eighty works; while the Bibliotheca Piscatoria of Westwood and Satchell, published in 1883, registers no less than 12,148 distinct works on, or incidentally dealing with, angling, the fisheries, and fish-culture. In most of these works no mention is made of fly-fishing—indeed, many of them are purely statistical—but a goodly minority deal solely or chiefly with that art. Unfortunately, no later edition of this useful book of reference has since appeared; but in 1884 an event happened which directly influenced the growth and development of fly-fishing, and which will lighten the work of surveying its literature. This was the formation of the Fly-fishers’ Club. To bring together gentlemen devoted to fly-fishing generally. To afford a ready means of communication between those interested in this delightful art. The library formed in carrying out this last object contains a well-selected collection of the most important works on angling and fish-culture that have yet appeared. I shall have to refer to it again, but would first say a few more words about the Club. The Club owes its origin to a widespread feeling that there is something in fishing beyond the mere catching of fish, or, as the legend of the Club book-plate tersely puts it, “Piscator non solum piscatur.” This feeling long existed as a vague idea; the late Francis Francis reduced it to words, and the present Editor of the Fishing Gazette impressed it with life. The result was the Fly-fishers’ Club. It consists of over three hundred members, British and foreign, representing the House of Lords, the House of Commons, Art, Science, Literature, Medicine, Diplomacy, the Church, the Army, the Navy, the Bench, the Bar and the legal profession in general, Manufacture, Commerce, and Trade, wholesale and retail. In short, amongst its members are men of every known occupation, and some of no occupation at all. For it must be remembered that while the busy man spares time to kill fish, the idle fishes to kill time: and the one common bond that unites the heterogeneous mass of humanity is the love of fly-fishing. And there is reason in the rhyme, which aptly expresses the hope of every fly-fisher. BUT TO RETURN TO our library. The first fact that strikes one on reading the catalogue is the vast increase during the last decade in the percentage of works wholly or in great part dealing with fly-fishing. As supply implies demand, this of course shows the growing importance of the fly-fisher in the book market. But the slightest examination of the books themselves shows more than this. It shows how varied are his tastes. Save that fly-fishing is, in some measure, a common factor throughout, it would be difficult to imagine works differing more widely one from another in treatment and design. Here we find a pastoral, instinct with love of Nature in her country gown. First, in the writer’s mind, is the harmony of willow-herb or loosestrife, contrasted with the many-tinted greens of grass, rush, and sedge; the soft, modest melody of the reed-warbler; the scent of the meadow sweet. Next, the metallic lustre of the dragon-fly, poised on its rustling wings of gauze as it hovers over its prey, the defenceless lepidoptera; and, last of all, not without obvious effort, comes the memory of that three-pound trout he lost in the weeds, under the dark green tassels of the water-crowfoot. Our hand then falls perchance on a volume of historical and antiquarian research, full of booklore, studded with quotation, translation, paraphrase, and adaptation from the classics and from the learned monks of the middle ages—who loved fishes no less the loaves. It starts from pre-historic China and ancient Egypt; plods through Greece and Rome, halting in the second century of the Christian era to tell us of Oppian’s five books on fishing, and to quote the translation of the passage from Ælian describing the mode of dressing an artificial imitation of the “Hippurus” —whatever fly that may have been—as tied by the Macedonian fishermen, and used by them to catch certain river fish with “spotted skins”—doubtless trout. Avidum vorata decipi scarum musca? And this fly that was eagerly gobbled by the greedy scarus may equally well have been an artificial as a natural insect. Moreover, Martial likens gifts to hooks, not to baits impaled on hooks. Surely this looks as if hook and bait were one and inseparable, as in the case of an artificial fly! But I have dwelt too long on this book. It contains, inter alia, all that is known and much that is still matter of conjecture about the fresh- and salt-water stews of the Roman patricians—notably of Lucullus the luxurious, and his boon companions—but little of special interest to the fly-fisher; so we will seek further. We must not pass over this little book, bound in green cloth with a gem engraved thereon, representing a man fishing with a rod no longer than his arm. The rod, in its length, may fairly represent the scant measure of practical hints on fishing to be gleaned within; but the work is overflowing with pleasant personal anecdote, happy descriptive word-painting, quaint northern legends, and local romance. In spite of its title, Angling Sketches, it may be read and relished by all, whether of the craft or no. It is written by Andrew Lang. AND NOW WE COME to a group of books wherein angling and natural history—two sisters that should wander hand-in-hand in peace by the riverside—have had a struggle for mastery. Of these books Dr. E. Hamilton’s Recollections of Fly-fishing for Salmon Trout and Grayling and his Riverside Naturalist are typical examples. In the first he sets himself the task of imparting to his brother anglers the results of much reading, and a long and varied experience with the rod in many lands and many waters. But, alas! science is too strong for him. After forty-six charming pages of selections from early records of salmon capture, with shrewd notes thereon, glimpses of autobiography, and personal recollections, he plunges into the natural history of salmo salar to the extent of thirty-nine more pages; and thenceforth his work becomes a sandwich—by no means unpalatable, but none the less a sandwich. His next literary effort The Riverside Naturalist, is a light farrago of science, seasoned with a delicate flavour of fishing. It is hard to digest at one meal, but once tasted, it is sure to be tasted again. Passing over the few—happily very few—books that are little more than minute records of slaughter, with full particulars of time and place, we now come to the technical books of the craft—books treating of the make, choice, and use of flies and tackle; and here we find the most marked advance during the last few years, both in number and character. 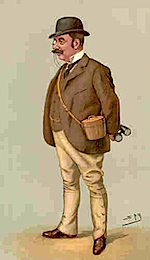 Vanity Fair's caricature of Alfred E.T. Watson of the Duke of Beaufort's Badminton Library. 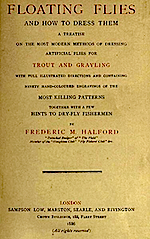 The second volume discusses angling for salmon and trout. Now Mr. Cholmondeley-Pennell is a man of many gifts and many methods. He is, as we know, an elegant writer, and no stranger to the Muses. In company with his Puck on Pegasus he has ventured short flights in the fairyland of fancy. But once at work on fishing-tackle, he ties himself down (as with his most favourite “jam knot”) in his choice of words to those that most exactly and adequately explain the dry mechanical and technical details with which he has to deal. He has stopped his ears with “cobbler’s wax,” and is deaf to the charm of grace and euphony. His style, here, is that of the patent agent, not of the poet. But no sooner has he escaped from the hooks than he plunges into a stream of humorous personal anecdote that loses nothing in brightness and ease from its juxtaposition with purely descriptive and didactic passages. His next contribution is an essay on the “Natural History of British Salmonidæ.” This, as might be expected in a work by the author of the Angler Naturalist, is so set forth to be easily “understanded of the people.” Major Trahern follows with a masterly treatise on “Salmon-fishing with the Fly,” too full of matter for abridgement. Other contributions of merit complete the volume. Omitting, as outside my present purpose, those which treat of spinning and bait-fishing, and, for the moment, passing over a short account of salmon and trout culture by Mr. T. Andrews, of Guildford—a subject on which I shall say a few words hereafter—I find but one that calls for notice. It is entitled, “Fly-fishing for Trout and Grayling,” or, “Fine and Far Off.” It is written by Mr. H. R. Francis, a veteran fisher whose store of knowledge has been garnered here and at the Antipodes. 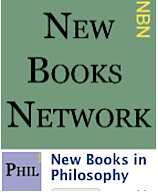 It is noteworthy, not for what is new, but for what is old, in its precepts. Many an ancient adage, overlooked by recent writers, or purposefully passed over by them as matters of common knowledge too obvious to be stated, is here examined, tested by practical experience, and, when necessary, qualified or limited in its application. Take, for example, “the admirable rule of Charles Cotton,” expressed in the maxim, “Fine and far off.” Mr. Francis wisely points out that this rule might not be blindly followed; that “far off” means “out of sight”; and that, when the angler can hide behind a bush or other shelter, it is worse than useless to cast a longer line than is necessary to cover the fish. Had he but added that “fine” was a relative term, to be construed with due regard to the size of the fish in each particular stream, he would have spared many a trout a sore mouth, and many a fly-fisher a sore trial of temper! His essay abounds with shrewd observation and useful hints, and is written with ease and polished grace. He has the art (rare since Hazlitt’s time) of using apt quotations, not as added ornament, but as a rich thread woven in the fabric of his text. He may be studied by the fly-fisher with profit, and read by all with pleasure. And now I come to the books which are nothing if not practical. Of these, Mr. F. M. Halford’s Floating Flies and How to Dress Them, and his Dry Fly-fishing, in Theory and Practice, command the first place, as being, within certain limits, the best books on fishing with the artificial fly ever written. The limits are these. His books apply to the capture of brown trout and grayling only; salmon and sea trout being outside their purview. They apply to only one method of using the artificial fly, namely, the method of using it dry, so that it may float on the surface of the water. This needs explanation. In the happy days of old, when fish were foolish, and fishermen were few, one, two, three, or more flies were fastened at intervals on a line; a cast was made across the stream, the rod-point was depressed, and the flies allowed to sink as they drifted down the current. When the line became fully extended, the flies began to rise to the surface, and to sweep round in a curve towards the bank on which the angler stood, the fly nearest him, called the “bob-fly,” tripping and dancing as it skimmed the water. By an inward inclination of the rod-point, the angler then brought his flies close under the bank, and, unless they were seized by some hungry trout, in mistake for larvæ rising to the surface to cast their skins, stretch their wings, and soar in the air, he would take a step or two downstream, and cast again; thus searching the whole water for fish. This method of proceeding is still adopted with success in rapid, rocky, and turbid streams, but in our tranquil and transparent rivers of the south, the trout see, and have learned to fear, the angler and his wiles. AS FISH HAVE GROWN more knowing, man has grown more cunning, and has devised new schemes to outwit his prey. Now, instead of fishing downstream, he fishes upstream, that he may be below and behind the fish, and, therefore, less in sight: for fish, it must be borne in mind, always lie with their heads upstream. Moreover, where he used to stand, he now kneels or crawls. That his rod may not be seen, he moves it horizontally—not vertically, as of old—and he never, if he can help it, allows the point to extend over the water. That his line may be seen as little as possible, he no longer searches the water haphazard, but reserves his cast until he has found and noted the exact position of a rising fish, or, at any rate, of a fish lying so near the surface as to suggest the strong possibility that it is on the watch for flies. Then, instead of using two or three flies, he selects one, imitating, as closely as may be, in colour and size the natural flies he has observed on the water. This he deftly casts so that it shall fall on the water as lightly as a flake of snow, some eighteen inches or so above the fish, and float with its wing erect,—“apeak,” as they say of a cutter’s foresail—and if he allows it, without check or suspicious movement, to be carried by the stream over the nose of the trout. At that instant, if Fortune smiles, he sees a bubble rise, hears a faint sound like a baby’s kiss, and the tug-of-war begins. If the trout refuses, or the cast was not accurately made, he lets the fly drift on, far below the fish, so that the ripple made in withdrawing it from the water may not disturb the trout, and proceeds, verberare nebulas, to dry his fly by whipping it backwards and forwards through the air until it is once more buoyant. He then tries again. Should the trout refuse at the second time of asking, the angler, if wise, will change his fly; if very wise, he will change his fish, making a mental note to “call again.” This slight sketch will enable the reader to see the importance of closely imitating the flies on the water, and the skill required in presenting the counterfeit to fish. 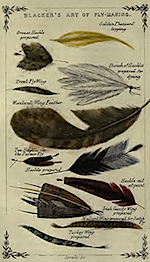 Mr. Halford’s first book gives ninety hand-coloured engravings of the most killing flies on southern streams, with illustrated directions on how to tie them, and full particulars of the materials used in their manufacture. In his second he describes in writing, and shows by plates taken from instantaneous photographs, how to cast. Beyond this, he tells us, if not all that is known, more than most of us know, of dry fly-fishing and all that is incidental thereto. His work is direct in purpose, distinct in precept, and clear in expression. At more than this he does not seem to have aimed. The book of the All-round Angler, by John Bickerdyke; Rod and River, by Major Fisher, which, amongst other things, gives the dressing of some salmon-flies not elsewhere described; How and Where to Fish in Ireland, by Hi Regan—useful not only in the “distressful island”; Shooting and Salmon-fishing, by A. Grimble; and Fraser Sandeman’s By Hook or by Crook. In both these last the illustrations are exceptionally good. And I cannot end without recording the pleasure I found in reading Favourite Flies and their Histories, by an American lady, Mrs. Mary Orvis Marbury. 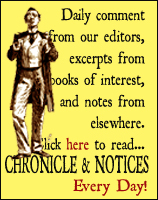 This is clearly a labour of love, and the reader cannot fail to share the enthusiasm of the writer. Not even the plates (and they are marvelously coloured) can arrest one’s attention until the last chapter is read. (1)	Fly-fishers have vastly increased in numbers. (3)	Have increased in rental value. (4)	Trout have become more scarce. (5)	Trout are smaller in size. (6)	Trout do not rise to the fly as freely as they did. But let us briefly examine these statements. That anglers with the fly have increased in number, will, I trust, be granted by the reader who has followed me thus far. That they should increase is natural. Without dilating on the “calm delights” of angling, or “dropping into poetry,” a good reason for the popularity of fly-fishing as a recreation can be given from a purely utilitarian point of view. WE ARE BUSY PEOPLE. Population increases; competition ties us day by day more closely to the desk. It is difficult, sometimes impossible, to arrange beforehand to leave one’s business at a fixed hour and day. Most pastimes require preliminary arrangement. Not so fly-fishing. The angler needs no companion. For him “solitude is sometimes best society.” He depends on neither horse nor dog for his sport. Rod in hand and creel on back, he can start at a minute’s notice. Leaving Waterloo Station at 4.55 p.m., I have myself landed a salmon on the banks of the Test before 8 o’clock in the evening of the same day, and I have often caught trout in the Wandle within an hour and a half of leaving my office in Lincoln’s Inn Fields. Nor does fly-fishing need the mass of baits and tackle required for most forms of angling. In these days of eyed hooks, more flies than are likely to be wanted in a day’s fishing can be packed in a small pill-box. The River Lea nears the Thames, by Joseph Pennell (1857-1926). But let us pass to the alleged decrease in the area of fishable water. I fear this is true. Springs have been tapped, streams diverted, and watersheds drained to fill reservoirs of corporations and companies; and rivers once deep-flowing and fish-full, are now dry watercourses, or at best dribbling runnels. Perhaps this cannot be helped, as domestic water supply is more important than sport. Some corporations, moreover, have made amends by stocking their reservoirs with fish. But that manufacturers, to save their own pockets, and sanitary authorities, to save the pockets of the ratepayers, should be suffered to poison and pollute our streams passeth all understanding. It is well that County Councils have power to check this evil; and the fact that in some districts, where complaint has been loud, this power has already been exercised is a hopeful sign; but the fish “that knows no touch of eloquence,” cannot protest. He must suffer in silence, until some serious human epidemic indirectly brings him relief. Now, as to the retail value of fisheries. This has no doubt increased. A salmon-fishery on the Lower Test is now let to six rods at £100 a rod. I rented half this water seven years ago at £50 a year. Trout-fishing in the best part of the Test, Itchen, and Kennet, now commands a rent of at least £100 a mile, and it is seldom to be obtained at any price. It is, no doubt, difficult at first sight to reconcile this increase in value with the statement that fish are fewer, smaller, and worse risers than of old. But it must be remembered that there are now many more anglers seeking to rent water and less water is to be had; and that any piece of water suitable to trout, although it may contain but few, can, by stocking and breeding, be made to carry as many fish as can reasonably be desired. But, first, have trout (for henceforth I shall speak of the non-migratory salmonidæ only) fallen off in numbers? The authorities in books and newspapers tell us so; and their view is strongly corroborated by the growth and development of commercial fish-culture. Abroad, the product of fish farms goes direct to the market to supply food for the people. Here is goes direct to our rivers to supply sport for the fishermen. Commercial pisciculture in Great Britain owes its origin and growth to the angler’s desire to make good the deficiency in the product of the natural spawning beds in his river. The demand for ova, fry, and yearlings has greatly increased of late. This shows an increase of more than 400 per cent. on the output ten years ago. Sir James R. Gibson Maitland has published no account of his fish-cultural work at Howietoun for some years. (I notice, however, that in the year 1885-6 he sold no less than 1,382,500 eggs of Lochleven trout alone.) And I have been unable to get details of the work lately done at Mr. Armistead’s Solway Fishery, Dumfries, the oldest commercial fish-cultural establishment in the kingdom. But I have no reason to doubt that the output from these noted hatcheries has increased in much the same proportion. I have mentioned three only out of many fish farms, and I have said nothing of the hatcheries and the stews attached to the private waters; but I have said enough to indicate decline in the natural fish-production of our rivers and streams. Let us consider what can be the cause of this. OVER-FISHING WILL BE the first suggestion. The angler who comes home grumbling, heavy at heart, and light in creel, may indignantly deny this; but although the individual take may be less, the total number of fish caught is probably greater now, owing to the increased number of rods, then it ever was. Want of judgment in weed cutting has much to answer for. Many anglers, who have more skill in covering and hooking a fish than resource in keeping it out of danger when hooked, hate weeds. This feeling makes them lend a ready ear to the suggestion of the keeper (prompted by due regard for his own convenience) that when he cuts the weeds he should make a clean sweep of them. The result is a river denuded of weeds, offering no shelter to the fish, and no obstacle to the deadly flue net of the night poacher. Not that the presence of weeds is always a protection to the fish, sometimes it leads to their destruction. In hot sunshine, “those long mosses in the stream,” when “hither thither idly sway’d,” are apt to betray the broad tail of some lusty trout, who, in fancied security beneath their shade, is lazily digesting a mash of may-fly or a gorge of minnows. Such a trout may be tickled; but a cool hand, in every sense of the word, is wanted for this sport—for sport it undoubtedly is, whether fair or foul is a matter of opinion. During the delicate preliminary process of testing by touch the exact position of the trout, should the operator’s fingers be sensibly warmer than the water, one lash of that broad tail which first betrayed the presence of the fish ensures its safety. It is wiser, therefore, until the crucial clutch is made, to use the weed as a glove between hand and fish. If this is done, and every movement of the hand keep time with the natural rhythm of the weed as swayed to and fro by the stream, a trout seems to enjoy the handling, and will stand a great deal of it without taking alarm. There is much to be done before you get in touch with your trout. The deeper the water the greater the confidence of the fish, but the greater also the difficulty of wading up to it without shake, splash, or suspicious shadow. The least vibration in the water, or variation in its natural flow, the slightest crunch in the gravel beneath it, the shadow of head or arm over-lapping the green canopy, and cast on the patch of golden gravel beneath this and the next long tress of weeds—these, or anyone of these, may scare the fish. Moreover, when the precise bearings of the trout have been ascertained, and the tresses of weed discreetly parted, it needs confidence, begotten of long practice in the poacher’s art to grip the fish so that one’s thumb and second (or, better still, third) finger are at once in perfect opposition, and at the right distance behind the pectoral fins, to get a firm hold on the slippery fish. Indeed, so many are the difficulties with which the tickler is beset, that some writers dispute the fact that trout so situated can be thus caught. That they could be so caught fifty years ago I have, I regret to say, no room for doubt. But tickling trout under weeds in deep water requires daylight, if not sunshine, and cannot be practised to any great extent without attracting the keeper’s notice. There is, however, a kind of night poaching on the shallows wherein weeds turn traitor to the trout. It is called “the crate trick,” and is practised on moonlight nights or between dawn and daybreak. The poacher is provided with a large shallow oval basket, wide at the base and narrow at the top; it has no bottom, and its lid opens on hinges. With this he walks into the water, and, having driven a trout under the shelter of a trailing weed, impounds both weed and trout under his basket. He then raises the lid sufficiently to admit the passage of his arm, and gropes about in the weed until he feels the trout, which is promptly tapped on the head and consigned to his pocket. Georgina Ballantyne's 1922 British record salmon (64 pounds) has been recently topped by Bev Street (66 pounds). In salmon rivers, owing to flood and spate, there are, as a rule, but few weeds, and these are shunned by the fish. In the tranquil Test, however, even fresh-run salmon will, in bright low water, seek shelter in the weeds. Some ten years ago I hooked a fish near Nursling Mill. In his rush up the river he passed on the far side of a pile and broke my line. While I was repairing my tackle, the keeper called my attention to a fish which was repeatedly throwing itself out of the water forty yards above us. I looked up from my work, and in the sunshine I distinctly saw the glitter of gut hanging from its mouth. It was my lost fish, there could be no doubt of that. I ran up the bank in time to see the fish turn, first on one side, then on the other, as it rubbed its head against the gravelly bed of the river, striving, no doubt, to free itself from the hook. When we drew near it buried itself under a thick patch of weeds. The water here was about five feet in depth, and ever and anon we could see the silver sheen of the salmon as it moved uneasily beneath the weed. At last, I could stand still no longer; I stripped, and gaff in hand, half walked, half swam, until I could feel the soft weed under my feet. I looked down but could see nothing owing to the shimmer on the surface of the water. My only chance lay in a dive. The water was cold, but I was keen, and allowing myself to drift a few yards down, so that I might not disturb the fish, I let my legs rise, pressed my chin to my chest, and dipping my head beneath the surface, swam underwater until I could touch the weed with my hand. I could see nothing of the fish, and was about to strike at hazard with the gaff, when a slight upheaval of the weed disclosed the thick end of my gut cast with a few inches of the broken reel-line attached to it. The gut cast was two yards long, the handle of my gaff was five feet long, the direction was clearly given by the floating line. I knew to an inch where to strike, and I struck, drawing the fish towards me, and placing my left hand on the point of the gaff hook to prevent the fish from wriggling off, while I struggled ashore as best I could without the aid of hands or arms, and returned home, having caught a lively “springer” and a serious cold. BUT TO RETURN TO our trout. Apart from the destruction of mature fish, there are causes over which the angler has no control, that seriously interfere with the natural reproduction of the trout. Of these by far the worst is pollution. I need say nothing of the poison from mines and factories that has deleted fish-life in some streams, and left them tenantless. The mischief there is immediate and obvious. But there is a form of pollution more widely spread, more insidious in its action, slower, but no less deadly in its effects. I mean pollution by sewage. Anglers whose visits to their water have been limited to the fishing season, and who have seen fine and well-conditioned trout lying at the mouth of a sewer and evidently enjoying themselves, are apt to say that sewage, unless in great quantities, does no harm to fish. Nor does it, to mature fish; but it is death to the eyed-ova, alevins, and fry. Some interesting experiments lately made in Germany have established the fact that a very small percentage of sewage matter is fatal to salmonidæ in the early stages of their development. It might well be imagined that drainage for purely agricultural purposes would not be injurious to the angler; but in fact it affects him seriously in more ways than one. For years before the present depression began agricultural authorities had cried aloud for land drainage, as the panacea that was to make the farmer happy and prosperous for evermore. Parliament at length took up the cry, and passed an Act enabling money advanced for this purpose to be charged on the land; and the country soon became a network of drains. Before this time, when heavy rain fell on the land, it percolated the soil, and slowly found its way by devious and undefined channels to the nearest stream. This kept the rivers more uniform in level. It also rendered the meadows through which it flowed spongy, marshy, prolific in sedge, rush, and rank grass—in short, made them a perfect nursery or fly, midge, and insect fit for trout food. Now all is changed. The surface rainwater, rushing through the drains, is discharged into a river a brown seething mass, carrying with it chemical manure, lime, and all sorts of impurity. If this happens when the trout are in the eyed-ova or the alevin stage the year’s hatch is destroyed. Whenever it happens, the river is quickly in flood and quickly again subsides to low-water level, there being no percolation, no trickling runs from its banks to maintain its level. And the fly nursery is no more. Agricultural depression has added a new terror to the fishing lessee—a plague of ducks. Now that the farmer can no longer thrive on the profits of his land, he relies on his wife’s poultry yard, and this, in the neighbourhood of a river, is apt to contain an inordinate proportion of ducks. It is now not uncommon to see as many as a hundred of these birds heads down, tails up, all busy in picking up their living on a sprawling bed; and the damage they do is incalculable. ON THE STATEMENT THAT trout have decreased in size I shall say but little. Its truth seems generally accepted; and the cause of this decrease is, by most writers, attributed to over-stocking the water. This may, in some cases, be the chief cause, but suitable water, food in plenty, and quiet shelter are all conditions materially affecting size. Moreover, the largest fish are rarely caught with the fly; and it may well be that trout give up fly diet and take to cannibalism and other evil courses, at an earlier age now than formerly. And this leads me to the last proposition I have to consider, namely:—“That trout do not rise to the fly as freely as they did.” The consensus of opinion on this point seems so strong that I think we may admit the fact and seek its cause. I have little doubt that the primary cause is hereditary vice. We have seen that the angler in most streams is dependent on the artificial propagation for his stock. The largest trout obtainable are selected as parent fish, because the larger the fish the greater the quantity of ova or milt it contains. Fish caught for this purpose are usually taken in nets from deep holes, weir pools, and hatch holes—places teeming with aquatic animal life—full of minnows, stone-loach and bullheads, crayfish, fresh-water shrimps, and other crustaceans relished by trout—but these places are not suited for the development of the larvæ of water-bred flies. The parents of the fry or yearlings turned into our streams were, therefore, in all probability, bottom or mid-water feeders, rather than surface feeders; their diet consisting more often of fish, snails, crustaceans, and submerged insects than of floating flies. At any rate, they must have escaped the flies of the angler to have lived long enough to be caught in the net. It is probable that the fry inherit the taste of their parents; and this taste is confirmed by education. As soon as the contents of the umbilical sac are absorbed, and the alevin becomes a perfect fish, the first food presented to him is liver and dog-biscuit, minced fine and passed through a sieve, and of such is his daily food until he is transferred from stew to river. Here he has to shift for himself, and he naturally continues to seek his food, as heretofore, in mid-water, not on the surface. And should he, once in his life, out of mere curiosity, or in the true spirit of empirical research, be tempted to taste the angler’s fly, he returns to the water a sadder but a wiser fish, henceforth to preach and practise the maxim, “In medio tutissimus.” Although I have used the word preach more or less in a spirit of playful exaggeration, I have used it deliberately; being convinced that fish have some power of communicating with each other. I must not enlarge on the subject here, but I will mention two facts that would seem to confirm my belief. 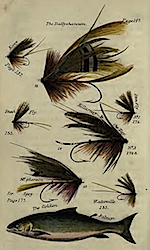 Two plates from Blacker's Art of Fly Making (1855). If a fly be cast in one of Mr. Andrew’s stock-ponds at Guildford, there is a rush and a fight for it amongst all the trout within whose range of vision it falls. If it be cast again, a few minutes after a trout has been caught and returned to the water, two or three fish only will compete for it. Repeat the process, and perhaps one may come, slowly, shyly, and in a half-hearted manner. But when several have been taken and returned—although the pond is large and crowded with fish—cast the fly where you will, the trout are shy, suspicious, and hard to catch. The next case I shall pray in aid must be within the experience of many fly-fishers. When trout are busily rising on a long shallow which is bare of weeds, it often happens that, on nearing the water with eyes fixed on a fish you hope to catch, creep as you will, you disturb another lying, perhaps, hidden from view under your own bank, and of whose presence you first become aware on seeing the wave he leaves behind him in his wild rush up the whole length of the shallow to the pool above. Every trout he passes joins in the flight. It is a case of sauve qui peut. And for the next half-hour the angler might as well fish in the highroad as on that shallow. But let the same fish swim over the same shallow at the same pace, when he is engaged in chasing another fish, or on private business, and is merely hastening his pace of his own free will, and not a single trout unless it be directly in his path, will leave off feeding, or take the slightest notice. But to return to heredity and education. If there be any truth in this theory, it might be well to catch the parent fish with the fly, and to feed their offspring in the stews, as far as possible, with floating food, thus teaching the young trout from early infancy to look towards heaven for his food, instead of grovelling for it at the bottom of the water. The late Basil Field, a deeply respected expert on this topic, was elected to the presidency of the Fly-fishers’ Club (now known as the Flyfishers’ Club) three times. This article first appeared in No. CCCXXVII Vol. LV, N.S. (1894). It has been manually transcribed exclusively for this New Series, with very minor edits to track usage. Copyright for this version is claimed. To obtain the unedited text, please see the copyright page for instructions. Please note the Fortnightly Review and fortnightlyreview.co.uk in citations based on this transcription. Additional resources of interest: Dr Andrew Herd’s A Fly Fishing History. 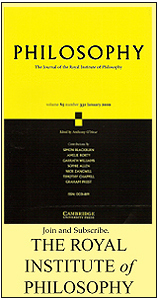 Waterlog Magazine and the Medlar Press publish related content. 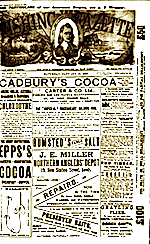 A mention of this article appears in the West Coast Times (NZ), 15 June 1894.